Mercedes-Benz has started following a new nomenclature for its vehicles. The ML is now called the GLE, which means that the GLE is a mid-size SUV. For the entry level SUV market, Mercedes has the GLA, which is based on the A-Class. For the top spectrum of the market, the Stuttgart-based automaker has been offering the GL-Class which has now been renamed to GLS following a minor mid-life facelift. 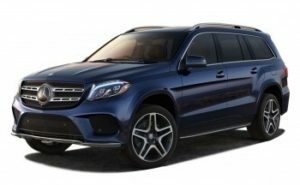 Mercedes claims that the GLS is the S-Class of SUVs. Now, we know that the S-Class is easily one of the best cars in this world, but is the GLS equally good? Let’s have a look. “The SUV now sports a more aggressive bumper with larger air intakes on the sides.” Specifically, the SUV now sports a more aggressive bumper with larger air intakes on the sides. Depending on trim, it also gets the same wavy insert seen on the GLE. The grille’s upper edges have been refined for a sharper look, while the headlamps feature new clusters and LED strips.